Negative views of economic news have risen sharply since last month and now stand at their highest level in well more than two years. Fully 67% say they are hearing “mostly bad” news about the economy, up 18 points in the last month alone and more than 40 points since the start of 2011. The public’s current views of economic news are now as bleak as they were shortly before Barack Obama took office in January 2009. At that time, 67% also said they were hearing mostly bad news about the economy, but that number fell sharply during the first few months of Obama’s presidency. The latest weekly News Interest Index, conducted Aug. 4-7 among 1,001 adults by the Pew Research for the People & the Press, finds increasingly downbeat views of news about individual economic sectors – from the financial markets to jobs to real estate. Nearly three-quarters (74%) say they are hearing mostly bad news about the job situation, while more than six-in-ten say they are hearing mostly bad news about financial markets (69%), gas prices (66%), real estate values (63%) and the prices of food and consumer goods (62%). Evaluations of news about the job situation are as negative as at any point since the Pew Research Center first began tracking them in June 2009. 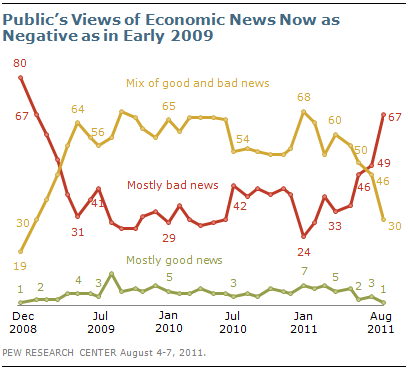 Perceptions of news about financial markets are now clearly more negative than at any point during this period. The survey finds the public closely tracked news about the economy last week, but the top story by far is the agreement by the president and Congress to cut federal spending and raise the debt limit. Nearly half (46%) followed news about the last-minute debt deal very closely; the same percentage followed news about the economy very closely. However, 45% say the debt limit agreement was the story they followed most closely; the economy was a distant second, at 19%. The debt limit agreement by political leaders in Washington also garnered the media’s attention, accounting for about a quarter (26%) of news coverage, according to the Pew Research Center’s Project for Excellence in Journalism (PEJ). Other economic news filled 19% of the newshole. News about the Federal Aviation Administration’s partial shutdown, violence following political uprisings in Syria, the candidates for the 2012 presidential elections, and the food shortage in Somalia accounted for much smaller portions of the newshole and garnered less attention from the public. Following a week of grim economic news from both Wall Street and Washington, majorities in nearly every demographic group now say they are hearing mostly bad economic news. More than six-in-ten Republicans (71%), Democrats (62%) and independents (69%) say that the news they are hearing about the economy is mostly bad. Since July, negative impressions of news about the job situation have increased far more among Democrats (up 22 points) and independents (up 25 points) than among Republicans (seven points), who expressed more negative views in previous surveys. 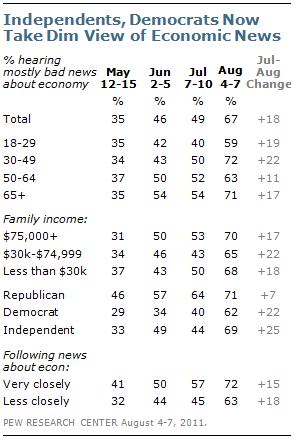 Majorities across all age and income groups also say they are hearing mostly bad news about the economy. And while 72% of those who have been following news about the economy very closely see the news as mostly bad so too do 63% of those who have been following the news less closely. As negative perceptions of economic news have grown to near record highs, so too have views of news about specific economic sectors. The jobs report released by the government on Aug. 5 showed a modest uptick in employment, but the public’s perceptions of news about the job situation have turned much more negative. Nearly three-quarters (74%) now say that the job news they are hearing is mostly bad, up from 58% in early June. The percentage saying they are hearing mostly bad news about jobs is at its highest point in more than two years. Yet there has been even a larger increase in the percentage saying they are hearing mostly bad news about financial markets. Nearly seven-in-ten (69%) say they are hearing mostly bad news about financial markets, up from just 40% two months ago. 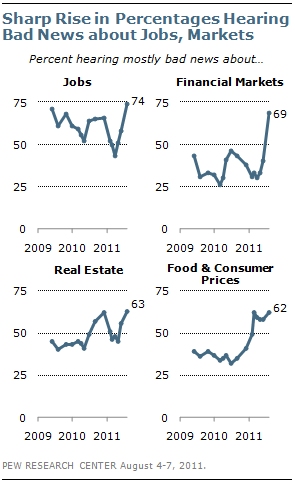 Negative perceptions of news about real estate values also have increased substantially since spring. Currently, 63% say they are hearing mostly bad news about housing, while 27% say the news is a mix of good and bad. In May, perceptions of the real estate market were far less negative: 45% said they were hearing mostly bad news while 35% said news was mixed. An exception to this trend is the public’s perception of news about gas prices. The percentage hearing mostly bad news about gas prices is unchanged from in June. Still, 66% say news about gas prices is mostly bad. That is well below the high point in March of this year, when fully 90% reported hearing mostly bad news about gas prices. Nearly half of all Americans (46%) say they paid very close attention to news that Congress and President Obama reached an agreement last week to cut federal spending and raise the debt limit. The public followed this news as closely as the budget battle in early April that nearly led to a federal government shutdown. About half (47%) followed those negotiations very closely. The debt limit agreement was the week’s top story in terms of both interest and coverage: 45% say it is the news they followed most closely. 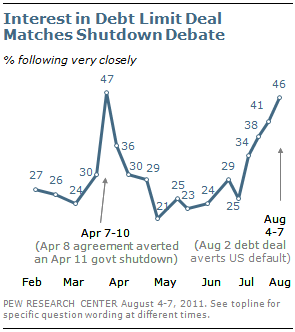 For its part, the media devoted 26% of all coverage to the debt deal. Broader economic news, including reports about the plunging stock market and the new jobs report, was followed very closely by 46% of the public. For two-in-ten (19%) the economy was the week’s top story and it accounted for the same share (19%) of the newshole, according to PEJ. The public was far less attentive to the other top stories of the week. Just 3% each say that the candidates for the 2012 presidential elections, the food shortage in Somalia or a partial shutdown of the Federal Aviation Administration (FAA) was their most closely followed story. The 2012 elections and the famine in Somalia each received 2% of news coverage, while the FAA shutdown accounted for 6% of the newshole. Congress approved a measure late Friday allowing the FAA to resume operations and bring furloughed employees back to work. Close to two-in-ten (17%) tracked this news very closely. The percentage following news about 2012 presidential candidates very closely (18%) has changed little in the last several months, and is on par with interest in election news in early 2007. 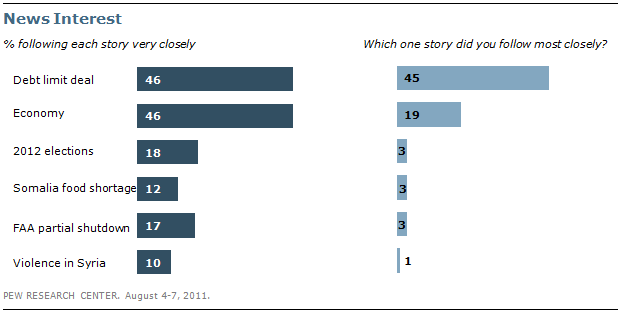 Republicans and Democrats are just as likely to report following news about the 2012 candidates very closely (20% and 16%, respectively). One-in-ten (10%) reported following the ongoing violence in Syria very closely, while just 1% say this was their top story of the week. 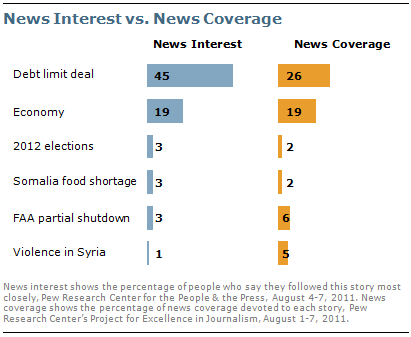 The media devoted 5% of all coverage to the conflict, making it the fourth most heavily covered story of the week. About one-in-ten (12%) followed news about the famine in Somalia caused by severe drought and an ongoing civil conflict. Interest levels are comparable to Sept. 1992 (11% very closely), when Somalia struggled with famine and a civil war. Public interest in the situation increased dramatically in January 1993 (52% very closely) after the U.S. sent troops to restore order and alleviate the famine. These findings are based on the most recent installment of the weekly News Interest Index, an ongoing project of the Pew Research Center for the People & the Press. The index, building on the Center’s longstanding research into public attentiveness to major news stories, examines news interest as it relates to the news media’s coverage. The weekly survey is conducted in conjunction with The Project for Excellence in Journalism’s News Coverage Index, which monitors the news reported by major newspaper, television, radio and online news outlets on an ongoing basis. In the most recent week, data relating to news coverage were collected August 1-7, and survey data measuring public interest in the top news stories of the week were collected August 4-7 from a nationally representative sample of 1,001 adults.